IKEA’s Ranarp Pendant Lamps illuminate a hallway that leads to the back of the house—the former altar area. A bedroom and bathroom flank the corridor on each side. Homeowners Danny Newman and Christy Kruzick added this charming hexagonal-tile greeting to the home’s entry. The style gives a nod to the church’s 1930s roots, while the black-and-white palette hints at the modernity inside. You’ve thought about how cool it would be to buy the old church that’s for sale in your neighborhood and convert it into a home, but you’ve never been quite brave enough to take that plunge. Take heart; most of us aren’t. But then there’s Danny Newman, a guy so obsessed with renovating—and living in—unusual places (his previous house was a renovated burrito factory) that he asked his bride to promise in her wedding vows to support his unusual passion. “He made me agree to live in weird buildings for the rest of our lives,” Christy Kruzick says. “I think the word was ‘interesting,’ ” Newman suggests. Either way, Kruzick (a story editor for the HGTV show “Fixer Upper”) wasn’t too surprised when Newman (a tech entrepreneur) decided the old Greek Orthodox church near Governor’s Park should be their next home. 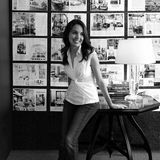 The truth is, her husband’s willingness to take on big risks—and even bigger design challenges— inspires her. “He has zero fear, which gets me out of my comfort zone and allows me to start dreaming,” she says. “It becomes a collaboration.” We sat down with the couple to learn about their latest labor of love—and what it’s like to live in a former house of worship. able spaces, but we didn’t want to kill the grandeur, so we made sure that any new walls didn’t go all the way to the ceiling. The living room, dining area, and kitchen are all one big, open space. At the back, bedrooms on each side enclose part of the area where the altar used to be. Each has a big bathroom and a lofted seating area above the bedroom. “It’s an only-what-we-need look,” Newman says of the living room furnishings, which include a sectional sofa, Stockholm 2017 rug, and Hektar floor lamp from IKEA. The custom coffee table, made by David Mather Metalworks, is topped with a slab of marble salvaged from the church’s altar. 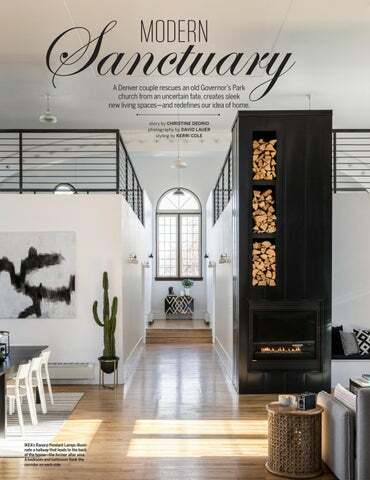 The chimney, made from the same black exterior siding as the tiny house, is a fake; a built-in bench to the right of the gas fireplace hides its vent pipe. Previous spread: The Greek Orthodox church has a brown brick exterior, two steeples, arched windows—and nearly 8,000 square feet of living space on three levels. tons of color in our last house to this simple, modern, neutral space. paying $15,000 to get it sounded crazy, so I hacked together my own version. The light bars are Home Depot work lights that I opened up and soldered white cords to. Christy can attest that we had lots of exposed wiring everywhere for a while. Kruzick: It was like a maker’s space in my living room. The kitchen’s simple layout consists of two parallel lines of sleek, white Veddinge IKEA cabinetry topped with white quartz counters. The outside wall accommodates a dishwasher, sink, and refrigerator; the 13-by-5-foot island includes a range with downdraft vent—and plenty of space for cooking and casual dining. The Tercet barstools are by Housefish, and the light fixture is a custom design that Newman made from Home Depot work lights. light is coming through the windows, it does have a peaceful quality; a really bright, light vibe. And finally, has anyone asked to have a wedding at your house? Newman: Oh yeah, we’ve already done a few. Clockwise from top left: Housefish’s modern Tension table and Lock chairs are unlikely—but ideal— counterpoints to one of the Greek Orthodox church’s traditional arched windows. Newman designed the tiny house, which can function as a completely separate space with its own private entrance, or can connect to the main living area when the two panels that form the corner swing open. The tiny house’s gabled roof creates a unique partial wall in a lofted sitting area. The 1933 structure’s original floors and woodwork are still in remarkably good shape. A sleek IKEA dining table is topped with metal lanterns from Target and a set of Greek worry beads from local lifestyle boutique Homebody. Five coat hooks and a storage bench transform the entryway into a mudroom for storing coats and shoes. Framed love letters, written during World War II, were originally part of the couple’s wedding decor. Ready-made cabinets weren’t an option for this bathroom—“We had the arch of the building to contend with,” Newman explains— so the couple hired local manufacturer Livia to design and build the custom vanity. Marble penny tile on the floor matches an original niche’s marble ledge. Right: Rich texture—a woven throw from Hearth & Hand with Magnolia for Target, a plush sheepskin throw from World Market, and a chevron-patterned rug from Target— warms up the bedroom’s crisp black-andwhite palette. The print above the bed is “Edie Sedgwick, 1966” by Andy Warhol. Deny Designs’ Inbetween credenza, featuring a blackand-white geometric pattern created by Australian design collective Three of the Possessed, makes a bold statement at the end of the hallway.